I just love the MFT Harvest Mouse set. I wanted to make the mouse with the basket of cherries into a mouse with a box of ornaments with a few falling out. I got out my I Knead You set and masked off the kitty in the box. 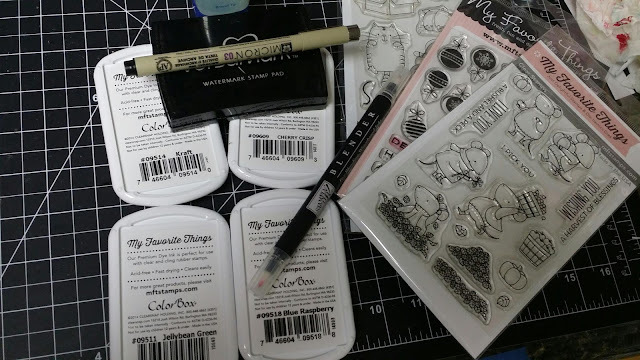 I stamped the box in Memento Tuxedo Black and then I masked off the mouse and stamped it below the box. 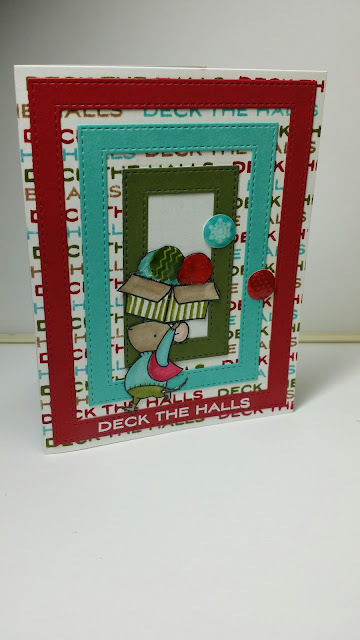 Next I added ornaments and stamped some loose ones using the Ornament Banner set stamping them in Blue Raspberry, Wild Cherry, and Jellybean Green dye inks. I used these same colors plus Kraft to stamp Deck The Halls on the card base alternating colors repeatedly and created a background. These colors were also used to color my images and add detail using a blender pen. 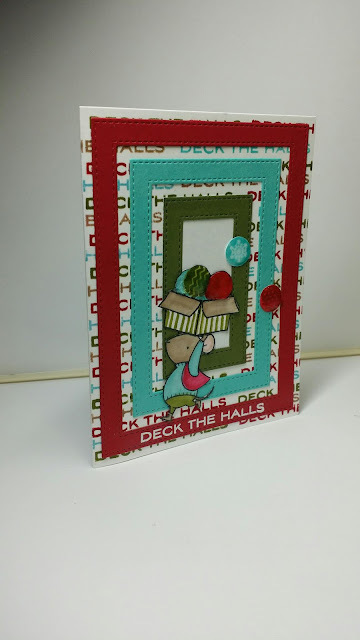 Using the MFT stitched rectangle frame I cut the large from wild cherry, the medium from blue raspberry, and the small from jellybean green which I backed with white. My sentiment is embossed in Ranger White embossing powder. I just love the color scheme in this and the use of the 3 frames! I love this Birdie Brown set and I have it too! Love your card for Christmas! I just love those sweet mice and your cute Christmas card!